Umm, yeah. The source for those published reports is a disturbed soul named Michael Lutz, who is sadly struggling with PTSD and alcoholism. He also has made death threats against Milwaukee County District Attorney John Chisholm and his family. The documents released Friday by a federal appeals court also show that prosecutors believe Walker personally solicited donations for conservative group Wisconsin Club for Growth to get around campaign finance limits and disclosure requirements as he fended off the recall attempt in 2012. Aides told Walker to tell donors that they could make unlimited donations to Wisconsin Club for Growth without having the gifts publicly disclosed. 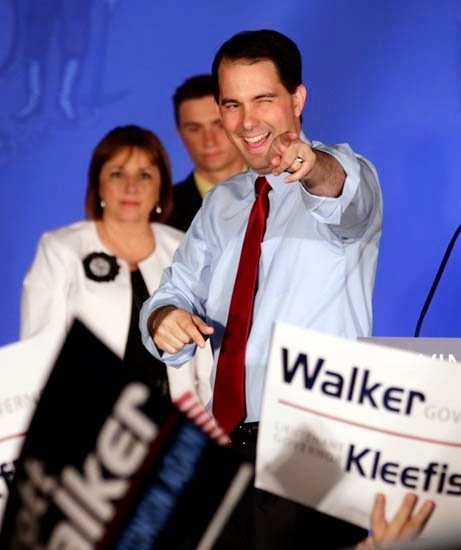 Wisconsin Club for Growth then funneled the money to other conservative groups that advertised on Walker's behalf. "As the Governor discussed ... he wants all the issue advocacy efforts run thru one group to ensure correct messaging," Walker fundraiser Kate Doner wrote to campaign adviser R.J. Johnson in April 2011, a little more than a year before the recall election. "We had some past problems with multiple groups doing work on 'behalf' of Gov. Walker and it caused some issues ... the Governor is encouraging all to invest in the Wisconsin Club for Growth." Will is obviously confused between free political speech and pay for play corruption. But that's not surprising when one thinks about it. They are confused about a lot of things. Two simple reasons for this writing 1. George Will is a ridiculous DC hack that hasn't had a clue on anything resembling reality in 30 years . 2. Will serves on the Bradley Foundation's Board of Directors and won a $250K. "Bradley Prize" for peddling the best right-wing BS in 2007. Republicans love to protect their own free speech, but the rest of society isn't privy to the same rights. And I am tired of hearing Republicans whine about it. Walker and his ilk MUST lose this election to send a strong message that we are not going to put up with his unlawful behavior & his bending of the rules to suit his own interests and those of his donors. WALKER MUST BE STOPPED. VOTE BURKE! Mr. Lutz knows a lot. Did Mike Grebe put Stewie Taylor in contact with Mr. Lutz? If not, who did? Did Mr. Lutz approach Stewie Taylor on his own? That's certainly possible, but why not give it to Sykes? Did Sykes turn it down? What about Paul Gigot at the Wall Street Journal? Per Jake above, Gigot's another recipient of $250,000 from the Bradley FDN. Did Mr. Lutz contact him? If not, why not? If Mr. Grebe's involved, how is attacking the wife of the District Attorney consistent with the promoting the "social welfare" goal of the not-for-profit Bradley FDN?